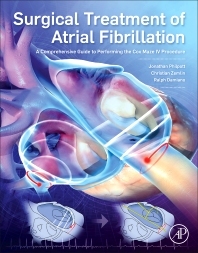 Surgical Treatment of Atrial Fibrillation: A Comprehensive Guide to Performing the Cox-Maze IV Procedure is the first all-inclusive description of this rapidly growing surgery, setting the standard in the field. The Cox-Maze IV procedure is a complex surgery, and its success depends critically on correct execution. With FDA approval, the first RF ablation device for treatment of the Cox-Maze IV procedure has become more important than ever to combine scientific information for the procedure with its connection to human application. This comprehensive text provides step-by-step instructions from an experienced Cox-Maze IV surgeon and is written in the style of a mentor advising his mentee in the operating room. It contains over a dozen lessons described in detail, with illustrations, photographs and a discussion of possible complications and appropriate ways to deal with them. Additionally, the book describes sequencing for the surgeries that are typically performed concomitant with the Cox-Maze IV procedure, determining the optimal way to combine surgeries. Cardiac surgeons, fellows in cardiac surgery, medical students inclined toward cardiac surgery and cardiology researchers will find this book to be of great importance to their work. Dr. Jonathan Philpott, Medical Director of the Electrophysiology Program at Sentara Norfolk General Hospital, is an internationally renowned expert on the Cox Maze IV procedure, has learned it directly from its inventor Dr. Cox, and since refined his approach in several hundred procedures that he has performed. He is a leading enroller in multiple national clinical trials that have evaluated the Cox Maze IV procedure. He is a Diplomat of The American Board of Thoracic Surgery, and a Fellow of the American College of Surgeons, a member of the International Society for Heart and Lung Transplantation, and the Heart Rhythm Society. Dr. Christian Zemlin is the Director of the Cardiac Electrophysiology Lab at Old Dominion University. He has done basic research on arrhythmia mechanisms and particularly atrial fibrillation for 15 years. He uses voltage-sensitive florescent probed to experimentally study cardiac activity large-scale parallel computer modeling to understand how arrhythmias are initiated and maintained. Other research interests include imaging of tissue structures using optical clearing and confocal; microscopy and the general theory of excitable media. He has published over 50 peer-reviewed articles (in the category of Medicine), book chapters, and peer-reviewed abstracts. His work receives increased citations year over year from 2005-2014. Dr. Ralph J. Damiano is a pioneer in the area of minimally invasive cardiac surgery. His developmental work on robotically assisted microsurgery for coronary artery bypass grafting (CABG) earned him a ComputerWorld Smithsonian Award in June 1997. Damiano performed the first robotically assisted CABG procedure in North America in December 1998. He completed the first prospective clinical trial in the world on robotically assisted CABG and is the current President of the International society for Minimally invasive Surgery. He has also been president of the Society of Clinical Surgery. He is one of the world pioneers in the surgical treatment of arrhythmias. His team at Washington University is world renowned for its clinical and basic research on the surgical treatment of atrial fibrillation. He has authored more than 250 scientific publications in the category of Medicine and is the top rated author of the top 100 in this research area by both scholarly output and citation count. His major contributions have been in the area of myocardial preservation during heart surgery, surgical electrophysiology and minimally invasive cardiac surgery. He has been associate editor of the Journal of Thoracic and Cardiovascular Surgery and is on nine other editorial boards. He has served as a member of the Surgery and Biomedical Engineering Study Section at the NIH.